I’m so excited to tell you about a new subscription box…. Jade Crate!! A bohemian & vintage styled subscription box. Does that not fit us here?! The perfect subscription box for the boho chic in you, and for living the bohemian lifestyle. Whether your bohemian style and spirit is every day, weekend, or special occasions, JadeCrate boho boxes will give you the best items to incorporate into your home, office, wardrobe, and feed your inner hippie too. Each surprise subscription box is designed to feed your bohemian spirit. 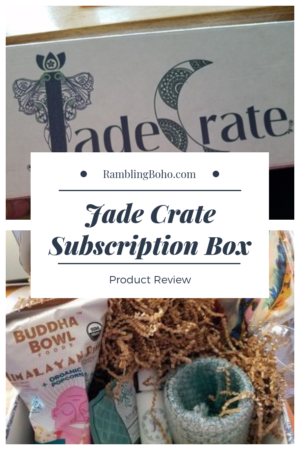 JadeCrate’s boho subscription box is carefully curated to ensure your satisfaction. Your monthly subscription box contains a mix of global, fair trade, USA made fashion accessories, home goods, natural skin care, organic snacks, and more. Global Fair Trade, Handcrafted, Home and Personal Accessories to Feed Your Bohemian Spirit. They have scouted around the world and the US to find just the right boho items uniquely chosen to help you bring the bohemian lifestyle into your home and office. There are 5 boxes to choose from. Options range from $25 to $50 (USD) per month. The box I received was pretty awesome with some really nice items. A beautiful scarf, a decorative glass candle holder, lotion, tea, a pair of earrings, a ring, and some popcorn. It was carefully packed, and arrived in great shape. You should head on over to JadeCrate and check ’em out!